We eagerly wait for the cool, crisp fall air, shorter days, longer dark night, and Halloween. With shorter days and longer nights, we need to make it easier for your dogs and cats to be noticed by people driving home from work, picking up children, or enjoying an evening out. Keep your pets safe by using reflective collars or lights on their collars when you are out for an evening walk with you dog. Make sure you pets are inside during rush hour traffic or are on a leash. Halloween is just around the corner. 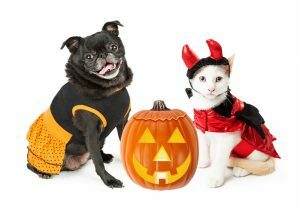 The noise and costumes can be frightening and scary for your family dogs and cats. When you open the door for all the little goblins, your pets may bolt out the door. It is best to have a safe, secure place in your home to confine your pets while one and all enjoy the Halloween fun. Be sure to keep all the holiday treats out of reach of your family cats and dogs. Cats picky eating habits make then less likely to break into your Halloween candy. Chocolate is toxic to both cats and dogs. If you know you pets have gotten into chocolate, seek immediately veterinary attention. If you are not sure, your pet has eaten chocolate but notice your pet is anxious, uncoordinated, vomiting, has diarrhea, or rapid breathing contact your veterinarian immediately. Candy made with sugar substitutes, if eaten by your pet, can lead to low blood sugar resulting in seizures. Immediate veterinary attention is needed.